This unanimous statement was published by the Canberra Commission in 1996. Among the commission members were internationally known former ministers of defense and of foreign affairs and generals. The nuclear-weapon states do not intend to abolish their nuclear weapons. They promised to do so when they signed the Nuclear Non-Proliferation Treaty (NPT) of 1970. Furthermore, the International Court in The Hague concluded in its advisory opinion more than 20 years ago that these states were obliged to negotiate and bring to a conclusion such negotiations on complete nuclear disarmament. The nuclear-weapon states disregard this obligation. On the contrary, they invest enormous sums in the modernization of these weapons of global destruction. It is difficult today to raise a strong opinion in the nuclear-weapon states for nuclear disarmament. One reason is that the public sees the risk of a nuclear war between these states as so unlikely that it can be disregarded. It is then important to remind ourselves that we were for decades, during the Cold War, threatened by extinction by nuclear war. We were not aware at that time how close we were. In this article I will summarize some of the best-known critical situations. Recently published evidence shows that the danger was considerably greater than we knew at the time. The risk today of a nuclear omnicide—killing all or almost all humans—is probably smaller than during the Cold War, but the risk is even today real and it may be rising. That is the reason I wish us to remind ourselves again: as long as nuclear weapons exist we are in danger of extermination. Nuclear weapons must be abolished before they abolish us. 1983 was probably the most dangerous year for mankind ever in history. We were twice close to a nuclear war between the Soviet Union and the USA. But we did not know that. The situation between the USA and the Soviet Union was very dangerous. In his notorious speech in March 1983, President Reagan spoke of the “Axis of Evil” states in a way that seriously upset the Soviet leaders. The speech ended the period of mutual cooperation, which had prevailed since the Cuba crisis. 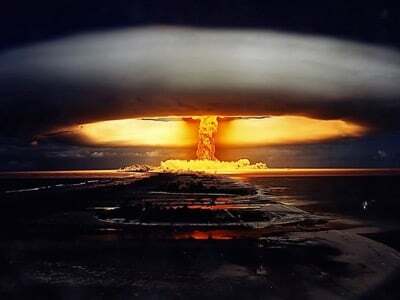 In the Soviet Union many political and military leaders were convinced that the USA would launch a nuclear attack. Peter Handberg, a Swedish journalist, has reported of meetings with men who at that time watched over sites where the intercontinental missiles were stored. These men strongly believed that an American attack was imminent and they expected a launch order. In Moscow, the leaders of the Communist party prepared for a counter attack. The head of the KGB, the foreign intelligence agency, General Ileg Kalunin, had ordered his agents in the world to watch for any sign of a large attack on the Mother Country. A previous head of the KGB, Jurij Andropov, was now leader of the country. He was severely ill and was treated with chronic dialysis. He was the man ultimately responsible for giving the order to fire the nuclear missiles. The nuclear arms race was intense. The USA and the Soviet Union were both arming the “European Theater” with medium-distance nuclear missiles. President Reagan’s “Star Wars” program was a source of much anxiety on the Russian side. The belief was that the USA was trying to obtain a first strike capacity. In Russia, a Doomsday machine was planned—a system that would automatically launch all strategic nuclear weapons if contact with the military and political leaders of the country was completely disabled. The increased risk of war was felt particularly strongly by those in Russia who were ordered to prepare for an immediate response in case of a nuclear attack. The command centre situated in the military city Serpukov-15 was the hub for the vigilance, evaluating reports from satellites in space and radar stations at the borders. Colonel Stanislav Petrov was ordered to take the watch on the evening of September 25, instead of a colleague who had called in sick. Late in the evening, the alarm sounded. A missile had apparently been fired from the American west coast. Soon two were detected; finally four. The computer warned that the probability of an attack was at the highest level. Petrov should now, according to the instructions, immediately report that an American attack had been discovered. Against orders, he decided to wait. He knew that if he reported a nuclear attack a global war would be likely. The USA, the Soviet Union, and most of mankind would be exterminated. Petrov waited for more information. He found it very unlikely that the USA had launched only a few missiles. Petrov was well informed about the computer system and he knew that it was not perfect. After a long wait the “missiles” disappeared from the screens. The explanation came at last: There was a glitch in the computer system. Petrov had himself been involved in developing the system. Maybe this special knowledge saved us? Or unusual self-confidence and courage in an unusual individual? This fateful event became known when a superior officer, who had criticized omissions in Petrov’s records of the evening, told the story on his deathbed. Petrov has received rather little recognition in Russia. Just like the “Petrov incident,” the “Able Archer” crisis was known only to a few military and political leaders in Russia and the USA until decades later. Only in 2013 could the Nuclear Information Service get access to the classified US file. Important documents from Russia and Great Britain are still not available. Why do our leaders feel they need to “protect” us against the truth of the greatest dangers mankind has faced? “Able Archer” was a NATO exercise carried out in the beginning of November 1983. The purpose was so simulate a Soviet invasion stopped by a nuclear attack. About 40,000 soldiers participated and large troop movements took place. Similar exercises had been carried out in previous years. The development could be monitored by Soviet intelligence through radio eavesdropping. What was new was that the tension between Soviet and the USA was stronger than before. In the background was the Soviet operation RYAN, an acronym for an attack with nuclear missiles. RYAN had become the strategic plan of the Soviet KGB two years earlier, on how to respond to an expected American nuclear attack. The combination of Soviet paranoia and the rhetoric of President Ronald Reagan did place the world in great danger. Soviet leaders thought that this exercise could be a parallel to Hitler’s Operation Barbarossa, the military maneuver that suddenly was turned into a full-scale attack on the Soviet Union. The Soviet leaders placed bomb planes on highest alert, with pilots in place in the cockpits. Submarines carrying nuclear missiles were placed in protected positions under the Arctic ice. Missiles of the SS-20 type were readied. NATO concluded the exercises after a few days, with an order to launch nuclear weapons against the Soviet Union and Eastern Europe. No missiles were fired, however, and the participants went back home. After the exercise the British Prime Minister Margaret Thatcher learnt from the intelligence service how the NATO command had been ignorant of the serious misunderstanding in Russia of the intention of this exercise. She conferred with President Ronald Reagan. It is likely that this information, together with his viewing of the film “The Day After,” caused the conversion of the President which was expressed in his State of the Union message in 1984: “A nuclear war cannot be won and must never be fought.” Reagan continued this process up to the famous meeting in Reykjavik in 1986, when he and President Gorbachev for a brief moment agreed to abolish all nuclear weapons before the end of the century. An interesting and most worrying rendition of how the exercises were perceived in Russia is given in the documentary movie “1983: Brink of the Apocalypse.” The story is based on documents that became available in 2013 and on interviews with some of those who were active on both sides in the situation. Two spies were important in convincing the leaders of KGB that no attack was underway. One was a Russian spy in NATO headquarters who insisted to the KGB that this was an exercise and not a preparation for an attack. The other, a Russian spy in London, gave the same picture. We can conclude that a lack of insight in the USA and in NATO into the perceptions in the Soviet Union put the world in mortal danger. Did two spies save the world? Soviet nuclear weapons were placed in Cuba. Fidel Castro and Russia’s generals intended to use them if the USA attacked. A Russian submarine that came under attack carried a nuclear weapon. A nuclear attack on the US was closer than we knew. The development of this crisis has been described in several American books. “Thirteen Days” by Robert Kennedy is the best known and has also been made into a movie. As the story is so well known I will not repeat it here. In the reports, we can experience how badly prepared the political and military leadership were for such a situation, and how little these two groups understood each other. The generals saw no alternatives other than doing nothing or destroying Cuba with a full-scale nuclear attack. Robert Kennedy wrote that he even feared a military coup! The US side had little information about plans and evaluations in Moscow. There was no direct communication between Kennedy and Khrushchev. The final Russian answer to President Kennedy’s proposal was sent from the Russian Embassy to Kennedy by a bicycle messenger! (The “Hot line” was installed after—and because of—the Cuban Missile Crisis). The world knew at the time that the crisis was very dangerous and that a nuclear war was a real possibility. Decades later we know more. Thus, Cuban President Fidel Castro, at a meeting many years later with US Secretary of Defense McNamara, said that if the USA had attacked Cuba, Castro would have demanded that Russian nuclear missiles be launched against the USA. An American U-2 spy plane was shot down over Cuba during the crisis. Only much later were we informed that another U-2 plane in the Arctic had entered over Soviet territory, misled by the influence of the Northern Light! US fighter planes were sent to protect the U-2 plane. These planes were equipped with nuclear weapons for this mission. Why? Was it possible for the lone pilot to launch these weapons? What would have been the consequence had the nuclear torpedo hit the US aircraft carrier that led the US operation? Quite recently, reports have surfaced from the US base on Okinawa, Japan. During the Cuba crisis the order came to prepare for a nuclear attack against the Soviet Union. There was considerable confusion at the nuclear command at the base. An increase in the alarm level from DefCon-2 to DefCon-1 was expected but never came. A bizarre event, which could have been come from a novel by John le Carré, was called “Penkovsky’s sighs.” Oleg Penkovsky was a double agent who had given important information to the CIA—the US Central Intelligence Agency—about the Soviet nuclear weapons in Cuba. He had been instructed to send a coded message—three deep exhalations repeated twice—to his contact were he informed that the Soviets intended to attack. This sighing message was sent during the Cuba crisis to the CIA. The CIA contact, however, realized that Penkovsky had been captured and tortured and the code had been extricated. In November 1979, a recorded scenario describing a Russian nuclear attack had been entered into the US warning system NORAD. The scenario was perceived as a real full-scale Soviet attack. Nuclear missiles and bombers were readied. After six minutes the mistake became obvious. After this incident new security routines were introduced. Despite these changed routines, less that one year later the mistake was repeated—this time more persistent and dangerous. Zbigniew Brzezinski, the US national security adviser, was called at three o´clock in the morning by a general on duty. He was informed that 220 Soviet missiles were on their way towards the USA. A moment later a new call came, saying that 2,200 missiles had been launched. Brzezinski was about to call President Jimmy Carter when the general called for a third time reporting that the alarm had been cancelled. The mistake was caused by a malfunctioning computer chip. Several similar false alarms have been reported, although they did not reach the national command. We have no reports from the Soviet Union similar to these computer malfunctions. Maybe the Russians have less trust in their computers, just as Colonel Petrov showed? However, there are many reports on serious accidents in the manufacture and handling of nuclear weapons. I have received reliable information from senior military officers in the Soviet Union regarding heavy use of alcohol and drugs among the personnel that monitor the warning and control systems, just as in the USA. The story of the “Norwegian weather rocket” in 1995 is often presented as a particularly dangerous incident. Russians satellites warned of a missile on its way from Norway towards Russia. President Yeltsin was called in the middle of the night; the “nuclear war laptop” was opened; and the president discussed the situation with his staff. The “missile” turned out not to be directed towards Russia. I see this incident as an indication that when the relations between the nuclear powers are good, then the risk of a misunderstanding is very small. The Russians were not likely to expect an attack at that time. Indian soldiers fire artillery in northernmost part of Kargil region. Close calls have occurred not only between the two superpowers. India and Pakistan are in a chronic but active conflict regarding Kashmir. At least twice this engagement has threatened to expand into a nuclear war, namely at the Kargil conflict in 1999 and after an attack on the Indian Parliament by Pakistani terrorists in 2001. Both times, Pakistan readied nuclear weapons for delivery. Pakistan has a doctrine of first use: If Indian military forces transgress over the border to Pakistan, that country intends to use nuclear weapons. Pakistan does not have a system with a “permissive link”, where a code must be transmitted from the highest authority in order to make a launch of nuclear weapons possible. Military commanders in Pakistan have the technical ability to use nuclear weapons without the approval of the political leaders in the country. India, with much stronger conventional forces, uses the permissive link and has declared a “no first use” principle. The available extensive reports from both these incidents show that the communication between the political and the military leaders was highly inadequate. Misunderstandings on very important matters occurred to an alarming degree. During both conflicts between India and Pakistan, intervention by US leaders was important in preventing escalation and a nuclear war. We know little about close calls in the other nuclear-weapon states. The UK prepared its nuclear weapons for use during the Cuba conflict. There were important misunderstandings between military and political leaders during that incident. Today all British nuclear weapons are based on submarines. The missiles can, as a rule, be launched only after a delay of many hours. Mistakes will thus be much less likely. France, on the contrary, claims that it has parts of its nuclear arsenal ready for immediate action, on order from the President. There are no reports of close calls. There is no reason to label the collision between a British and French nuclear-armed submarine in 2009 as a close call. China has a “no first use” doctrine and probably does not have weapons on hair-trigger alert, which decreases the risk of dangerous mistakes. Why was there no nuclear war? Yes, how come there was no more nuclear war? In the nuclear-weapon states they say that deterrence was the reason. MAD—“Mutual Assured Destruction”—saved us. Even if I attack first, the other side will have sufficient weapons left to cause “unacceptable” damage to my country. So I won’t do it. Deterrence was important. In addition, the “nuclear winter” concept was documented in the mid-1980s. The global climate consequences of a major nuclear war would be so severe that the “winner” would starve to death. An attack would be suicidal. Maybe this insight contributed to the decrease in nuclear arsenals that started after 1985? MAD cannot explain why nuclear weapons were not used in wars against countries that did not have them. In the Korean war, General MacArthur wanted to use nuclear weapons against the Chinese forces that came in on the North Korean side but he was stopped by President Truman. During the Vietnam war many voices in the USA demanded that nukes should be used. In the two wars against Iraq the US administration threatened to use nuclear weapons if Iraq used chemical weapons. Many Soviet military leaders wanted to use atomic bombs in Afghanistan. What held them back? Most important were moral and humanitarian reasons. This was called the “Nuclear Threshold.” If the USA had used nuclear weapons against North Vietnam the results would have been so terrible that the US would have been a pariah country for decades. The domestic opinion in the US would not have accepted the bombing. Furthermore, the radioactive fallout in neighbouring countries, some of them allies to the US, would have been unacceptable. Are moral and humanitarian reasons a sufficient explanation why nukes were never used? I do not know, but find no other. Civil society organisations have been important in establishing a high nuclear threshold. International Physicians for the Prevention of Nuclear War has been particularly important in this regard. IPPNW has persistently pointed at the humanitarian consequences of nuclear weapons and warned that a global nuclear war could end human civilisation and, maybe, exterminate mankind. The opinion by the International Court in The Hague, that the use or threat of use of nuclear weapons was generally prohibited, is also important. The nuclear-weapon states do not intend to use nuclear weapons except as deterrence against attack. Deterrence, however, works only if the enemy believes that, in the end, I am prepared to use nuclear weapons. Both NATO and Russia have doctrines that nukes can be used even if the other side has not done so. In a conflict of great importance, a side that is much weaker and maybe is in danger of being overrun is likely to threaten to use its atomic weapons. If you threaten to use them you may in the end be forced to follow through on your threat. The close calls I have described in this article mean that mankind could have been exterminated by mistake. Only decades after the events have we been allowed to learn about these threats. It is likely that equally dangerous close calls have occurred. So why did these mistakes not lead to a nuclear war, when during the Cold War the tension was so high and the superpowers seemed to have expected a nuclear war to break out? Let me tell of a close call I have experienced in my personal life. I was driving on a highway, in the middle of the day, when I felt that the urge to fall asleep, which sometimes befalls me, was about to overpower my vigilance. There was no place to stop for a rest. After a minute I fell asleep. The car veered against the partition in the middle of the road and its side was torn up. My wife and I were unharmed. But if there had been no banister? The traffic on the opposing side of the road was heavy and there were lorries. The nuclear close calls did not lead to a war. Those who study accidents say that often there must be two and often three mistakes or failures occurring simultaneously. There have been a sufficient number of dangerous situations between the USA and Russia that could have happened at almost the same time. Shortly before the Able Archer exercise, a Korean passenger plane was shot down by Soviet airplanes. But what if Soviet fighters had, by mistake, been attacked and shot down over Europe? What if any of the American airplanes carrying nuclear weapons had mistaken the order in the exercise for a real order to bomb Soviet targets? In the Soviet Union bombers were on high alert, with pilots in the cockpit, waiting for a US attack. What if the fighters sent to protect the U-2 plane that had strayed into Soviet territory in Siberia during the Cuba crisis had used the nuclear missile they were carrying? Eric Schlosser tells in his book about a great number of mistakes and accidents in the handling of nuclear weapons in the USA. Bombs have fallen from airplanes or crashed with the carrier. These accidents would not cause a nuclear war, but a nuclear explosion during a tense international crisis when something else also went wrong, such as the “Petrov Incident” mentioned earlier, could have led to very dangerous mistakes. Terrorist attacks with nuclear weapons simultaneous with a large cyber attack might start the final war, if the political situation is strained. Dr. Alan Philips guessed in a study from the year 2003 that the risk of a nuclear war occurring during the Cold War was 40%. Maybe so. Or maybe 20%. Or 75%. But most definitely not zero—not close to zero. Today the danger of a nuclear war between Russia and the USA is much lower that during the Cold War. However, mistakes can happen. Dr. Bruce Blair, who has been in the chain of command for nuclear weapons, insists that unauthorized firing of nuclear missiles is possible. The protection is not perfect. In general, the system for control and for launching is built to function with great redundancy, whatever happens to the lines of command or to the command centers. The controls against launches by mistake, equipment failure, interception by hackers, technical malfunction, or human madness, seem to have a lower priority. At least in the US, but there is no reason to believe the situation in Russia to be more secure. The tension between Russia and the USA is increasing. Threats of use of nuclear weapons have, unbelievably, been heard. But we have been lucky so far.